Barrie, ON, January 11, 2017: One More Story Games is pleased to announce that two of its story-based video games took top honours for Game of the Year as awarded by TorontoGameDevs, beating out industry notables Ubisoft and Drinkbox Studios. Mandatory Upgrade: X-Marks the Spot is a cyberpunk mystery set in Hamilton, ON. Written by Chris Tihor of Ironic Iconic Studios, it is the studio’s first release. The game was created using One More Story Games’ proprietary game engine StoryStylus. It took first place in the competition. Special Agent Rachel Varley didn’t know what she was getting into when she rejoined the world of international intelligence & security, but she sure wasn’t expecting to be investigating a suspicious death on her first day back, and definitely not a death involving a runaway cybernetic exosuit. Will Rachel be able to get to the heart of the mystery and still manage to escape in one piece? 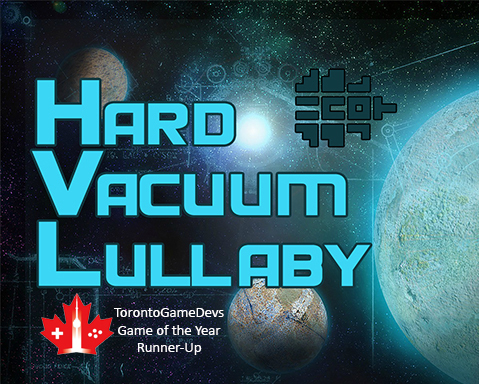 Hard Vacuum Lullaby, a free-to-play space adventure game, was penned by Barrie’s Sutherland Booth. This is Booth’s third published game with One More Story Games and offers 30 minutes of gameplay. It took second place in the competition. After a savage battle in deep space, the 2nd Yagoshan Expeditionary Fleet Battlecruiser #6 retreats to the orbit of a gas giant with other damaged vessels to undergo repairs by the fleets logistics and repair corvettes. Maintaining radio silence and far from the front lines, the crew of the fleet’s warships try to get some much-needed rest, leaving you responsible for anything that goes wrong. 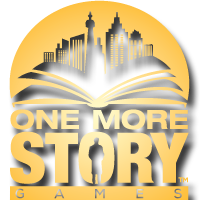 One More Story Games is an independent game studio in Barrie, Ontario. OMSG has developed StoryStylus, a simplified authoring platform for non-technical storytellers to create, publish and market story-based game content to web, mobile & Facebook. Writers publish games as solo creators or with a team, reducing the barrier to entry to the games industry. OMSG is working with #1 NYT best-selling author Charlaine Harris (36 million novels sold) to adapt her Lily Bard series into story-based games. The first installment is due to launch in October 2017.